Dear oh dear comes a point that even Nools most ardent supporters realises he's mentally challenged and clearly deluded. Newell and Deliar for the final time you thick twats PT does NOT repeat not do twitter except for my work account in my own name for 8 years plus. I do not sit all days manufacturing spurious twitter accounts unlike yourselves. From this point Newell if I see my name again in print I'll report it for deliberate harrassment and the Boys in blue can add it to their extensive file on you. Clear enough fatguts even for you. Newell is the one who got caught out posting as Rastus on twitter when he uploaded selfies and a director's box shot to the Rastus account instead of his own account. Sure there's a thread on it here somewhere. He makes a lot of these accounts up himself to keep the victim card going. 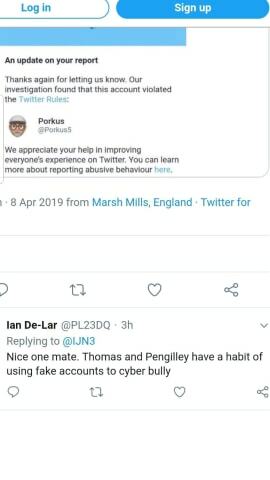 Pengilley using fake accounts to bully? FFS. I wonder if he could show me an example? Just one. Half a one? A bit of a one? The guy is probably still trying to clean the piss off his shoes. "Welcome to the new Pasoti" lmfao. Riddled with popups the main page took about three minutes to load then promptly crashed when I tried to read the above thread, way to go nobler killing pasoti so we don't have to. You talk shite Thomas. Has Rickler been arrested yet? Fecking clown you are. 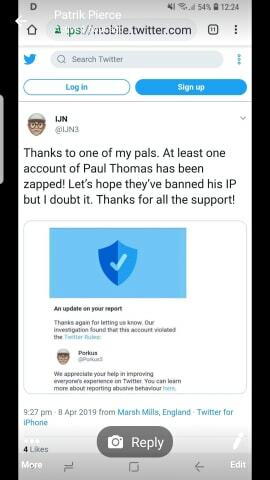 Only have to google Paul Thomas and Plymouth to see what a knobhead you are. How would I know if Ricks has had a tug yet. I'm not party to passenger manifests. Seeing as you seem to know so feckin much come and say it to my face. I have absolutely no problem with any of the regular guys on ATD using my real name in any format and I have more mentions by real name than probably all others put together, but that doesnt apply to this prick Yankee Green etc. Pasoti still the same run by bully boy Nool, for Nool. Either that or just ignore them and they will get bored. It seems to me that since 'the change' on pasoti, there seems to be only about a tenth of the people "online now" as compared to previously. So either the previous figures were being cooked (as we all knew) or the new version is turning people off big time! So which is it Nool? The other day when the place went down and required a login to see it there were still over a thousand guests viewing it. Funny that. You wouldn't put it past Nool and co to have program's running all the time logging people in and out to up the clicks and hence the revenue, he's playing the long game here foreshore. Well he had the tool to change the author of a post before so who knows what else they have. It works for me now but takes at least a minute to load every page. Geddon. Does the 300 lbs Cornish Janner, still read the PMS on the all new Cackoti? Looking at the new Pasoti layout it is difficult to imagine if anyone could have done a worse revamp. Truly awful. Like a kid has been let loose on a Font shop. All the wrong parts are emboldened - your eye is naturally drawn to completely insignificant text. Way ta go, Ian....actively making Pasoti even crapper.